Iris pseudacorus L. is a herbaceous perennial, 1-2 m tall. Leaves are sword-shaped, green to blue green, erect, flattened with a raised midrib, to 1 m long, about 10 per ramet (individual member of clone). Rhizomes pink in colour. Flowers are showy, large, with typical iris structure, yellow with brownish mottled markings upper surfaces. Flowering occurs in spring or early summer. The fruit is a dry capsule 4-7 cm long, with numerous pale brown seeds. This species is similar to some indigenous species. The table below describes some of Iris pseudacorus distinguishing features to Moraea huttonii, an indigenous species. Yellow flag iris is native to North Africa, Europe and Asia. It is now naturalised in Australia, South America and North America. This species is invasive in many temperate parts of the world. Iris pseudacorus spreads rapidly through both rhizome and water-dispersed seed. It fills a similar niche to that of Typha (species) and often grows with it, though usually in shallower water. While it is primarily an aquatic plant, the rhizomes can survive prolonged dry conditions and grow again in the rainy season. 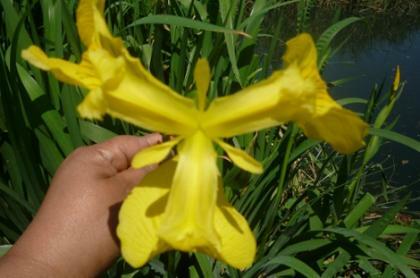 Yellow-flag iris was introduced in South Africa as an ornamental plant. It has been recorded in few localities in the country according to SAPIA database; in the Vaal River between Vereeniging and Vanderbijlpark in 2004, in Limpopo it has been recorded at Klein Kariba and in 2010 it was recorded in Aquestria (Gauteng). In 2011 more localities were discovered in Gauteng (Johannesburg and Pretoria area) and in KwaZulu-Natal (Durban and Howick area). 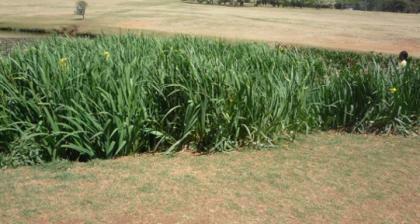 Yellow flag iris invades wetland and riparian communities. Yellow-flag iris is a fast-growing and fast-spreading weed that creates thickets in water just like cattail (dense stands). Iris pseudacorus is poisonous if ingested and may cause irritation to the skin when handled. 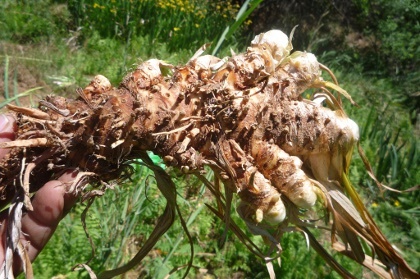 There are no herbicides registered for this plant in South Africa. It can be physically controlled by hand removal, but caution should be used if pulling out this plant because it can cause skin irritation; remove seed pods to help control population expansion; dig up small infestations; remove entire rhizome; burn where conditions allow. Although a number of insects and pathogens are known to attack yellow flag iris, no biological control agents are presently known. Goldblatt, P. and Manning, J. C. 2008. The Iris Family: natural history and classification. Timber Press, Portland. South African Plant Invaders Atlas. 2010. SAPIA News no. 17. ARC-Plant Protection Research Institute. South African Plant Invaders Atlas. 2009. SAPIA News no. 10. ARC-Plant Protection Research Institute. Sutherland W.J. 1990. Iris pseudacorus L. Journal of Ecology, Vol. 78, No. 3.